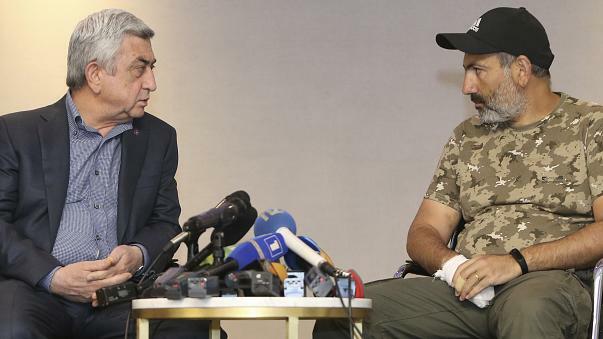 Armenia Prime Minister Serzh Sargsyan (left) faces opposition leader Nikol Pashinyan on April 22. Pashinyan’s arrest prompted the largest protest to date on Sunday, while scores of troops joined the anti-government movement on Monday for the first time. (by Ed Adamczyk, UPI) – Armenian Prime Minister Serzh Sargsyan resigned Monday after being in the post for just six days. Sargsyan, appointed prime minister April 17 after his 10 years as president ended, was a close ally of Russian President Vladimir Putin. Thousands of demonstrators in the capital, Yerevan, accused Sargsyan of corruption and authoritarian rule — and his resignation followed news that opposition leader Nikol Pashinyan was freed by police after his one-day detention. Pashinyan, a parliament member and organizer of the protests, was taken by police to an unknown location during Sunday’s demonstrations, in which two other opposition leaders and at least 200 protesters were detained by police. Published at United Press International on April 23. NOTE: Before answering the questions read the “Background” below. b) For what reasons had tens of thousands of Armenians staged peaceful protests after Sargsyan became prime minister? c) What surprising announcement did Mr. Sargsyan make upon resigning? In 2015, Armenians voted in a referendum to shift the country from a presidential to a parliamentary system, stripping powers from the president and giving them to the prime minister. The vote was marred by allegations of ballot rigging and claims Mr. Sargsyan wanted to simply switch office after his presidency ended. The ex-president had formally stated he would “not aspire” to the prime ministerial position, but on Tuesday last week the country’s parliament officially confirmed Mr Sargsyan in the post.